Prednicare tablets contain prednisolone, a steroid used to treat inflammation and allergic reactions in cats and dogs. It is normally given once or twice daily initially, but for longer courses of treatment it is sometimes given on alternate days. This has been found to be almost as effective as dosing every day, but is much less likely to be associated with side effects. Prednicare tablets are also used sometimes in high doses as part of a chemotherapy regime for malignancies. term use and when esters possessing a long duration of action are administered. Dosage in medium to long term should therefore generally be kept to the minimum necessary to control symptoms. Steroids themselves, during treatment, may cause Cushingoid symptoms involving significant alteration of fat, carboh ydrate, protein and mineral metabolism, e.g., redistribution of body fat, muscle weakness and osteoporosis may result. Adrenal axis. Following cessation of treatment, symptoms of adrenal insufficiency extending to adrenocorticol atrophy can arise and this may render the animal unable to deal adequately with stressful situations. Below are some recent questions we've received regarding Prednicare Tablets (Prednisolone) for Dogs & Cats, including answers from our team. Hello, my god is on 5mg dosage and requires half a tablet every day for his Addisons disease, please could you advise of the shelf life? Thanks for your question. The expiry date of our current stock is 05/2020. Long term use of any drug isn't ideal but if 1 tablet every other day is what stops her itching and gives her good a good quality of life then I would be inclined to speak to your vet about trying this. 1 tablet every other day is not a massive dose so this would be an acceptable risk given the improvement in quality of life. Of course you do need to weigh up any side effects which may occur as a result of the larger dose and decide if it is easier to live with these or the itching. Hi, my dog is currently on one prednisolone tablet a day prescribed by the vets, which are rather expensive! I was just wondering is this the same tablet as what vets prescribe? There a few different veterinary licensed brands of prednisolone but they are all guaranteed to be the same. You would not notice any difference it you switched to these. You will have to pay your vet for a written prescription which you need to send to us (email or upload etc). Vets vary enormously in how much they charge for this, but it should still be a lot cheaper to buy from us. Ideally ask your vet to prescribe at least 6 month's worth on the one prescription. My cat, aged 14 has recently been diagnosed with triaditis including a damaged liver. We are at the stage where he has substantial weight loss, increased appetite and increased faecal volume. He is pain free and is quite happy in himself. Following the diagnosis Mac was given pain killers, antibiotics, anti sickness injections. He now takes just one Prednicare 1mg tablet per day. Is it ok to give to give him a pancreatic enzyme supplement ie Pancrex? Would you recommend anything else for him to take to assist him and could you recommend a wet food for him? Many thanks. You should always check with your own vet about any additional medication which might help. My feeling is that a pancreatic enzyme supplement might well help given your description of the situation and it is certainly unlikely to be able to cause any harm. Additionally one of the liver support supplements containing S-adenosyl-L-methionine, such as Hepatosyl is often recommended for this condition. Any of the good quality wet foods should be appropriate and this is largely a matter of choice, but diets based on chicken or fish might well be easier to digest and metabolise. Lily's Kitchen make great foods which are high quality and very tasty to cats, so you could look at those. It sounds like your dog has a deteriorating skin problem of unknown cause. I understand your concern about over-use of flea treatments, but in fact they are all very safe and if you use different products, they can usually be given safely together. I note from what you say that the dog had a couple of sores before he was taken to the vets. It sounds as if he has got a lot worse since then, but it is much more likely that the treatment has failed to work and has allowed the condition to progress, rather than the treatment has caused the problem. It existed in a milder way before the treatment was provided. I would also say that any skin problem requires very diligent and effective flea control first, or you cannot know if the fleas are part of the problem. If you have lost faith with the current vets then you should ask to be referred to a specialist vet, or just go and see another one locally. However I suspect from what you say that the current vets are probably OK, but are just trying to deal with a difficult condition. Some of these things can cost a lot of money in tests and specialist examinations before they are properly diagnosed and treated effectively. That can cost a lot more than £500 unfortunately. I took my to the vet today, he is experiencing vertigo like symptoms. He has an inner ear infection and inflamed ear-drum. After reading the literature on your website about Prednicare I am confused as these symptoms are not among the treatable illnesses listed. Have I been given the wrong medication for my cats illness? I am concerned. 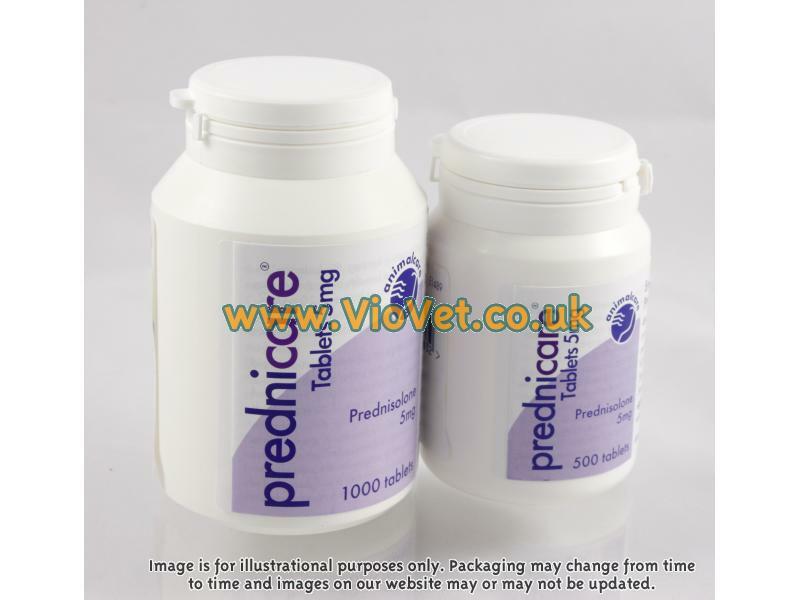 Prednicare is suitable and helpful for a very wide range of conditions and seems to be particularly helpful and relatively free from side-effects in cats. The general principle of its benefits is as a potent anti-inflammatory medication. This effect will apply to any part of the body and any condition where inflammation is seen. It is perfectly possible that the medication is entirely suitable for your cat and that it will be very helpful. It is true however that medicine is not as simple as that and there are some conditions where the prednisolone would not be beneficial. It is a steroid which can potentially have side effects, though at normal doses these are minimal in cats. Some conditions do not respond. On balance it is best to trust that your vet has correctly assessed your cat's condition and that the medication is appropriate. It does sound OK to me. If ever you are in doubt though, there is no harm in talking to your vet and asking him/her to explain their thinking behind the diagnosis and treatment. Many and varied is the short answer. These are steroids and at the low doses normally given for anti-inflammatory effect or anti-pruritis effect ("itchiness") then the side effects are usually a mild increase in thirst and urine production, and perhaps an increase in hunger. If the medication is given for a long period then some weight gain is likely, as well as perhaps some slight muscle wasting. If higher doses are given then these effects are more pronounced and the medication also causes immuno-suppression. This can be useful for the treatment of some immune diseases, but can hamper response to infections etc. At high doses, there are potentially lots of side effects involving the skin, liver, heart and other organs. All of the side effects are quite rapidly reversed when medication is stopped and although it might sound serious, many dogs (and people for that matter) are put onto these tablets because they are amazingly effective at treating a host of different problems. In the vast majority of cases, any side effects are mild and quickly disappear when a course of medication comes to an end. You and your vet should consider the potential risks and costs and balance them against the likely gains. This is true of all medication. Generally a medicine without any side effects is pretty feeble and can be of very limited benefit. The only reason to use more "potent" medicines with potential side effects is on the basis of the significant benefits they can deliver. A minor problem does not warrant using steroids. A significant problem might do. I have just purchased 32 predicare tablets from my local vet for my Westie. Hving seen your price of 5p per tablet i am suprised to find my local practise have charged me £9-60 for the above amount. Do you consider this charge excessive i must admit i do. Veterinary surgeons can charge whatever they want and sometimes their prices are very high. It is true that they cannot perhaps buy in the same bulk as we do, so they have to pay a bit more for their drugs in the first place. They also tend to be reluctant to charge sufficiently for their professional time (because people complain) so they load medication in order to top up some of their income. Our whole business revolves around selling everything as cheaply as we can for a high level of customer service, so our prices are usually much lower. In my view vets should charge for their skills in diagnosing and operating, but leave companies like us to retail the medication and food animals need. We do that side of things much better than them in my view. However if people continue to buy products from their local vet, then they will end up paying more for those things.